Social Media is the thing that keeps us connected. With smartphones starting to get faster internet connections than our home WiFi thanks to LTE, it’s no wonder we don’t spend more time on our phones than we do. We often spend more time on Social Media websites like Facebook and Twitter than we should be. Quite frankly they are more of a distraction than anything else, but we still love them and use them everyday. 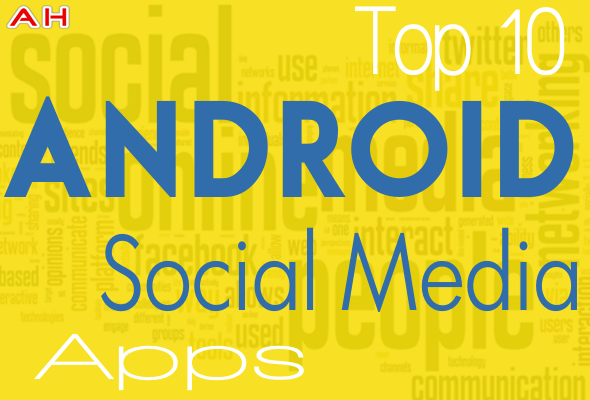 We’ve gone through over 700,000 apps on the Play Store to find 10 great Social Media apps that we think you’ll love. So let’s get started with number 10. Pinterest is one of the newer Social Media apps available on Android. It’s also one of the newer networks. Pinterest has been seen as a “girly” social network. And more than 70% of their users are women, that’s no surprise. Pinterest is like a web-based bulletin board. You can pin websites, pictures, and more on to different boards, that are visible to anyone on the web (that can be changed in your account settings). Pinterest was available on iOS for quite a while, and finally hit Android over the summer. The user interface isn’t quite Holo (Android 4.x) but it isn’t bad at all. Often referred to as the “Professional Social Network”. LinkedIn attracts a lot of professionals, and helps those of us looking for new jobs. You can post your resume on the network, as well as get recommendations from present and former co-workers and employers. Although LinkedIn isn’t a hugely popular network, it’s still worth a Top 10 spot, and recognition if you didn’t already know about it. The interface of the LinkedIn app doesn’t follow the Android 4.x guidelines but it’s not bad either. Give it a try. Path is yet another Social Media website that most have not heard of, or given the chance. Path is a unique Social network, it allows you to check in, post pictures, post what song your listening to and more. Basically it shows your path to the world. The overall user interface of the app is nice and clean, and very easy to use. I’ve also noticed that it’s faster than some other social apps I’ve tried out before. But that all depends on your data connection speed as well. Facebook recently bought Instagram for the sum of $1 Billion back in April. Instagram is a photo sharing social network. It allows you to add different filters to your pictures before you post them. You can post pictures taken with your camera or screenshots from your device. Now Facebook does own Instragram now, but they have said they will keep the two services seperate. Hopefully Facebook can do something with Instagram’s UI, but that’s unlikely since Facebook’s Android app looks terrible as well. Do you spend a lot of time in forums? If you’re like me, then you probably do. Many forums have their own app that you can use on your phone or tablet, by why have a separate app for each site, when they all use a form of Tapatalk anyways? You can access all of your forums from one app. Many of the popular Android forums including Rootzwiki and XDA are accessible through Tapatalk. So even though it is a paid app ($2.99), it’s worth completely it. Foursquare has been around for a bit. It’s a social network that allows you to check-in to different locations and allows you to compete with your friends on a leaderboard of check-ins. But you don’t get just one point for every check-in, depending on the category or if this is your first check-in you could get more. The app allows you to find new people, add/confirm new friends, check-in to nearby places, check your friends’ leaderboard and more. GetGlue is much like Foursquare, except it’s for TV Shows, Movies, Podcasts and Music. In the app you are able to check-in to whatever you are watching or listening to, as well as comment in the stream of the (For example) Big Bang Theory if that’s what you’ve checked into. You can also see what your friends have been up to and view your stickers. Another app without a Holo-themed UI, but it’s not a bad UI at all. I’ve seen plenty worse. It’s a great app, and can get pretty addictive. Try it out. There are hundreds of Twitter apps available on Android. Some have features that others don’t. But it’s almost impossible to find an app with all the features you want. Plume does. It has nearly 5 million installs, so it must be doing something right. Plume has the ability for you to add multiple Twitter accounts, colorize individuals tweets, auto-complete hashtags and so much more. Plume also has been updated (quite some time ago) to sport the Holo-theme introduced in Android 4.0 – Ice Cream Sandwich. If you’re a power Twitter user, you’ll want to check this one out. The grandfather social network of them all. For most of us, the first social network we joined was probably Facebook. I joined back in 2008 when it was only available for High School and College students, and eventually it became available to everyone. In the past Facebook has shown more support towards their iOS version of their mobile app, but recently they announced they would be switching from HTML5 to a native app on Android. That hasn’t shown up in the Play Store yet. Most people say they have many problems with the Facebook app, I don’t. The only problem I have is that I never use it. So if you’re a Facebook fan, go ahead and try this one out. So we are a Android news site. So you know we love just about every Google product out there. Naturally Google’s social network would be first. Google+ has been said to be a ghost town by many blogs recently including Mashable and The Next Web. But if you think Google+ is a ghost town, you aren’t using it right, or following the right people. I spend more time on Google+ than any of these other social networks. My most popular app on my phone and tablet is Google+. The app support the design guidelines implemented in Android 4.0 – Ice Cream Sandwich. The app lets you do just about everything. From updating your pages, to instantly uploading your pictures, to finding new people and managing your circles. It’s an all around great app.